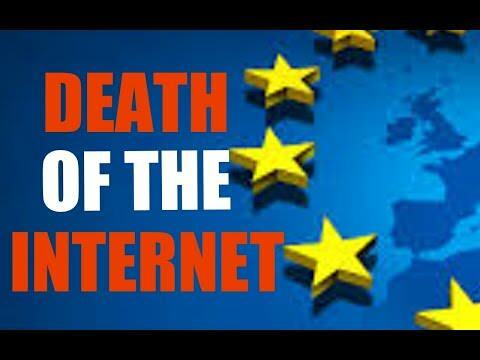 Target Liberty: Will EU Articles 11 and 13 Kill the Internet? Will EU Articles 11 and 13 Kill the Internet? Have you been following the EU's recently passed Article 11 and 13 (from the EU Copyright Directive)? Even though it's from the EU, just like the EU GDPR, it would have global impacts. I only heard about it the other day, but it seems like not only a major loss for consumers, fair use, and entrepreneurs, but more importantly like a major threat to non-mainstream media sources. I found the below, which while it doesn't have the best video, the content is interesting. Near the end the Youtuber makes a point that this seems like a power grab by the EU to control the media narrative. Article 13 is about copyright and to implement it would seemingly require automated filters that would be exorbitant to maintain. Instead of having a "take down" policy when copyright owners submit a claim, websites and platforms would need to make sure the content is never put up in the first place. Major platforms like Youtube don't even know how to deal with the technical challenges with what is being legislated. This also means the barriers to entry for smaller businesses and entrepreneurs will become impossibly high. Article 11 is the link tax and requires paying a tax when linking back to primary sources (e.g. mainstream media stories). Considering non-mainstream media sources tend to pull from multiple sources, they would be hit hardest by this legislation. This seems like it would also affect people (especially Youtubers) that comment on mainstream media stories and, in the process, help shape and inform the non-mainstream narrative. Like many things that involve government interference with free markets and a PPS, this is a very complex situation. I certainly have sympathy with those who have created product and want to protect it from poachers. And there is a lot of protecting against poachers in the Articles, that is good. But beyond that, the devil is in the details as Carlyle Group co-founder David Rubenstein would say. And Wired's Matt Reynolds gets is right when he says this is a battle between Goliaths. The original content producers, like movie production companies, versus social media platforms such as YouTube, Facebook and Twitter. There could certainly be all sorts of booby-traps in the Articles to hinder independent non-establishment expression but I don't think it will stamp out independent reporting and commentary on the internet. From what is known about the Articles to date, I can see a couple of things that might be problematic for independent voices like mine but I also see workarounds. Since I launched EPJ just over 10 years ago, I would say I have gone through 3 major model changes, if I had continued with the model that was generating cash for me early on, I would be dead in the water right now, so I adjust. Thus I am probably a little more sanguine about handling any bumps in the road that come my way from these Articles or, more important for me, anything that develops along these lines in the United States. To me it is change and, if you can't influence the direction of changes (and there is no way I would be able to influence changes in EU Articles 11 and13), you have to adapt to the changes whether they are good or bad. I am a good adapter, I think about change every week. It has made me big money in the past when I spotted changes that others didn't, including one involving the internet early on. Right now I spend some time thinking about being shadowbanned by major platforms since it definitely is going on to some degree with regard to TL and EPJ. I ask myself all kinds of questions from "Should I really spend time thinking about this?" to "Are there any workarounds?" I have come up with a couple of workarounds which for obvious reasons I can't go into at the present time here. In a way, on a personal level, I can't wait for the entire EU program to be operating so I can see how it is applied, there is no way the regulators have thought of everything and there will be big money to be made by figuring out the angles. From a more philosophical libertarian position, I really want to see more of how the regulations are interpreted and enforced before making a decision on whether the Articles are good or bad. Right now the obvious is the protection of product made by original creators and that is a good thing. I know there is an anti-IP sector of the libertarian movement, I am just not in that camp. When it comes to IP, I am in the Ayn Rand, Ludwig von Mises and Murray Rothbard camp. If you create something I want you to have control over your product. "If you create something I want you to have control over your product." The anti-IP strain of libertarianism doesn't disagree with the right-to-control aspect; the disagreement is over what "your product" means. The interesting thing from your perspective is readers can adjust and adapt as well. They can make sure like I do to go directly to each of your sites directly for years now. No search no googhell no middle man. Truth seekers and those that bring it to light will always find each other.